The following poems were enclosed with a photograph album sent as a birthday gift to Charles Darwin by his German and Austrian admirers (see letter from From Emil Rade, [before 16] February 1877). 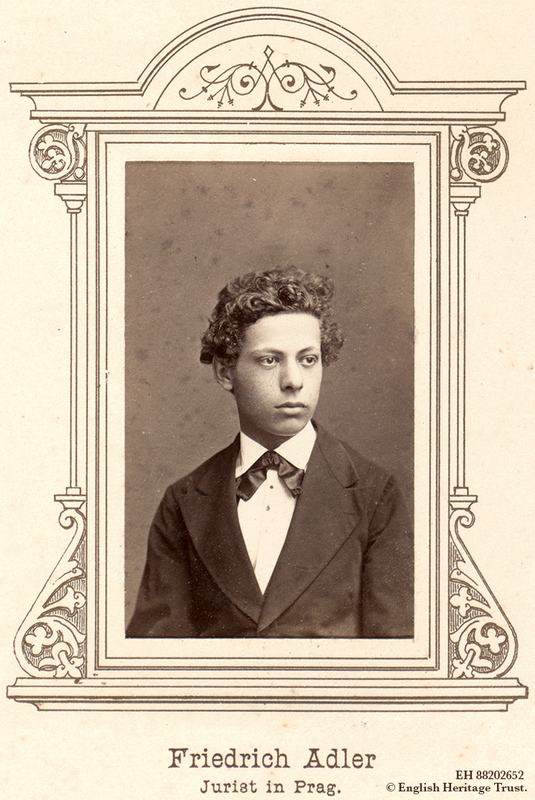 The poems were composed by Friedrich Adler, a young lawyer from Prague, whose photograph appears on page 20 of the album. One poem, ‘An die Poeten’, appeared in Rade’s account of the making of the album (Rade 1877, pp. 39–40), but the others were published for the first time in volume 25 of The Correspondence of Charles Darwin. The manuscript, composed of seven faintly lined sheets folded to form twenty-eight pages, is now in Cambridge University Library's Darwin Archive (DAR 261.11: 30). The album is in the English Heritage collection at the Darwins' home, Down House (EH 88202652). Another poem, ‘An Charles Darwin’ (To Charles Darwin), written by Arthur Fitger, is printed in the album itself. We are grateful to Andreas Mertgens, MA, University of Cologne, for providing the transcription and translation. Über die gaukelnde Flut segelt der Dichter dahin. O nimm den königlichen Glanz! Du stets noch, sonder Prunk und Schein? Die Krone ist, die Welt ist dein! Du bist der helle klare Tag! Ein mues Sein mit einem Schlag. Es dringt das Licht ein mit Gewalt! Und glänzen hoch von Pol zu Pol. Das neue Sein die neue Welt! And take the kingly radiance! Still without glamour and sheen? The crown, the world is yours! You are the bright clear day! A new being at a stroke. Light breaks in with might! And shine from pole to pole. The new being, the new world! Zur Jetztzeit Herr und Knecht. Von frischer Glut nichts weiß. Von dem, was draußen schreit. Scheint hell die Sonne doch! Es glüht das Neue heiß. Sie doch die neue Zeit! Of the good old days! Of fresh pursuits and ardour. That’s when your glory shone. When the sun shines brightly! Off with the old yoke! The new glows hot and bright. Be called the new days! O trau, schau, wem? kannst du’s verstehen? Was du nicht selber hast gesehen. Wir glauben nichts, wir wollen wissen! Wir glauben nichts!—wir wollen wissen! So ist die Welt. Wozu der Traum? Wir wollen auch die Träume missen! Wozu vertraun dem leeren Schaum? Den Boden und das Thier bezwungen. Trust, if you must. Do you understand? You have not seen with your own eyes. We don’t believe, we want to know! We don’t believe!—we want to know! Such is the world. Why the dream? We want to do without dreams! Why trust in empty froth? Has conquered the earth, the beasts. Wirf deine Heuchlermaske ab, Natur! Wirf ab den Tand, mit dem du dich umzogen! Hast du genug Geschöpfe schon betrogen! Die Kinder, um sie wieder zu verderben! Zu sehn, wie deine eignen Kinder sterben? Dass unverdächtigt sie das Leben kürze. Sich gegenseitig in die Nacht zu schicken. Hat sie nicht Recht auf eine gleiche Liebe? So tut es Not, dass ihre Schar zerstiebe? In der Natur die Ruhe und den Frieden? Und töten muß, wem nicht der Tod beschieden. Was machst so schwer den Abschied du vom Leben? Mit kindisch gierdevollen Blick zu streben? Um desto grauser uns zurückzustoßen. Erbaut und wieder einreißt nicht im Großen? Lass das Geheimtun, lass die Wahrheit blicken! Cast aside your hypocrite mask, Nature! Throw away the frippery with which you surround yourself! With your cunningly appropriated marks of God! Your children, only to cast them down again! To see how your own children die? So she can stealthily shorten life. To send each other into the night. Don’t they have a right to be loved? Must they be scattered in their droves? Oh quiet, you vain dreamers! Looking for peace and quiet in nature? Who doesn’t want to die, will have to kill. Why make the farewell from life so hard? Only to push us ever more cruelly away. Would you play that same game on a bigger scale? No secrecy, let us see the truth! Bis mich der Tod entreißt. Und glaubt, wenn ihr nichts wisst! In Schmerz und Leid sein Herz sucht zu erbauen! Zur Kirche gehn mit andachtsvollen Schritten! Und senket nicht sein Glück in nächtig Graun! Dem Blendung hat verschafft die hohe Ehre. Wer sich nicht selbst vertraut, den lasset beten! Leaving only cold ash behind. Until death shall take me. Despite or even because of it. And believe, if you know nothing! Seeks in pain and suffering to lift up his heart! Let him go to church with devout steps! Don’t diminish his happiness with nightly terror! Which earned its place with deceit. Whoever doesn’t trust in himself, let him pray! Ein Isisbild wie es die Saga kündet. Erzählt, der keck der Isis Schleier hob. Von schlauen Priestern und von Wundermachern! Und alles einem Wahn, einem Nichts! Es doch so nötig war, sich zu verbergen? Wenn man die Lüge zum Bestehen brauchte? Drum wehe dem, der je die Wahrheit sucht! Das zum Gesetze ward. So war’s berechnet. Als festen Schrittes er von dannen ging. An image of Isis, so the saga tells. Who dared to lift the veil of Isis. Played by priests and miracle makers! Was your goddess to whom you sacrificed. All for a delusion, for nothing! Felt such a need to hide it? When you depend on the lie for your existence? Woe betide anyone who ever sought the truth! That has become law. So was the scheme. As he walked away with a firm tread. Wie konntest so du irren! Den Zank mit Juden meiden. Gleich mußt du sie ersticken. Dann geht die Welt zu Grunde. Wenn wir nicht ihn verjagen. So sei dein ganzes Trachten. In the spirit of the Lord? They all still sing today? To quarrel with the Jews. You have to suffocate it. Then the world will end. It has to be your whole desire. Der Träger auch des Lichtes ist. Dass ihr den kühnen Sinn verklagt? Den eingelullt die Menscheit litt. Für einen Gott kasteit und quält? Was niemals sonst zum Morgen steigt. Weil ohne Mutter sonst das Kind? Weil nackt der Armen Glieder sind? Drin wunderbarer Trost sich fand! Vor unsern Augen liegt es grell! So ist’s doch Wahrheit, ist doch hell! Is also the bringer of light. You attack the daring mind? Always chooses instead of action. As the sun shines outside. What never comes to light. Ever truly shown in a mortal creature? So a child would not be without its mother? Because the poor man’s limbs are bare. It’s blindingly clear to our eyes! Still it is truth, still it shines bright! 1. Non che poco io dia, da imputar sono; Chè quanto io posso dar, tutto vi dono: Not that I give too little, can you accuse me; for all I can give, I give to you (Italian). The quotation is from the poem Orlando furioso by the Italian poet Ludovico Ariosto, first published in 1516. 2. Eppur si muove! : And yet it moves! (Italian). Attributed to the Italian astronomer and philosopher Galileo Galilei, and supposedly uttered as a defiant restatement, following his release from arrest, of his controversial assertion that the earth moved around the sun. 3. The title is a reference to the poem of the same name by Friedrich von Schiller. Mit der hier beifolgenden Ehrengabe deutscher Vertreter der freien Naturforschung und deutscher Verehrer des grossen Meisters und Vorbildes bringen dieselben zu dem Tage, an welchem vor nun 69 Jahren Ihr für die Welt so bedeutungsvolles Leben begonnen hat, mit hohem Dankgefühl, in aufrichtiger Bewunderung und in ehrfurchtsvoller Liebe ihre innigsten Glückwünsche dar.3 Möge es Ihnen, Sir, vergönnt sein noch lange zu wirken für die Wissenschaft und noch lange zu geniessen die Früchte Ihres ruhm- und thatenreichen Lebens! Ihrem Auge, hochverehrter Herr, vor dem so manches dunkel geschwunden; Ihrem Geiste, der so viele Räthsel gelöst, wird auch nicht verborgen bleiben, warum an diesem Tage nicht Alle erscheinen, die da theilhaftig geworden sind Ihrer unschätzbaren Gaben—die aber erschienen, sind auch vereinigt in dem festen Vorsatze: die Fackel, welche Sie, Sir, uns entzündet hochzuhalten durch alle Finsterniss und mitzuwirken, dass sie zu einer Sonne werde für die gegenwärtigen und zukünftigen Generationen. With the enclosed celebratory gift, German representatives of free scientific research and German admirers of the great master and role model wish to convey, with immense gratitude, sincere admiration and reverential love, their most heartfelt felicitations on the day on which 69 years ago your life began, a day which was so significant for the world.3 May you be granted, Sir, many more years to work for science and a long time yet to enjoy the fruits of a life that has been so full of glory and industry! Greatly respected Sir, it will not escape your eyes, before which so much darkness has receded, or your mind, which has solved so many riddles, why, on this day, not all have come forth who have profited from your inestimable gifts—but those who have come forth are united in the firm resolution: to hold high through all darkness the torch you, Sir, have lit, and to assist in letting it become a sun for present and future generations. 1.This letter is published in vol. 25 of The Correspondence of Charles Darwin. The original is in Cambridge University Library, DAR 261.11: 29 (EH 88206080). 2. The date is established by the relationship between this letter and the letter to Emil Rade, 16 February 1877. 3. The gift was a photograph album, which is still at Down House. Darwin was in fact 68 on 12 February 1877. On the making of the album and for a list of the persons included, see Rade 1877 and Gries 2006. 4. The full name of the society was Westfälischen Provinzialvereins für Wissenschaft und Kunst (Westphalian Provincial Society for Science and Art). 5. The album contained 165 photographs of German and Austrian scientists. Seventeen additional photographs were sent; however, these have not been found in the Darwin Archive–CUL or at Down House (see Gries 2006, p. 39). An accompanying series of poems by Friedrich Adler is in DAR 261.11: 30 (see above). These have been transcribed and translated in The Correspondence of Charles Darwin, vol. 25, Appendix VI. A number of other poems were included in Rade 1877. Rade, Emil. 1877.Charles Darwin und seine deutschen Anhänger im Jahre 1876. Eine Geschichte der deutschen Ehrengabe zu Darwin’s 69. Geburtstage.Strasbourg: J. Schneider. Sends album of photographs of German scientists as birthday honour. German civil servant. Enlisted for a year of military service then studied military management for two years; graduated as a commissariat-assistant in 1855. Served in Dusseldorf, Koblenz, and Münster; was decorated for his service in the Franco-Prussian War. Auditor from 1874; lived in Münster, 1873–91. Member of the zoological section of the Westphalian Provincial Society for Science and Art, 1874; of the botanical section, 1877. Organised the production of a dedicatory album of German and Austrian scientists in honour of CD, presented in 1877. Austrian lawyer, journalist, poet, and playwright. German painter, poet, and playwright. Studied at the Academy of Fine Arts, Munich, 1858–61, Dresden and Antwerp; in Italy, 1863–5. From 1869, lived in Bremen, where he painted frescoes. His poetry was influenced by the theories of Darwin and Haeckel, and his plays reflected themes of the German Kulturkampf. The transcriptions and translations of Adler's poems were originally published in The Correspondence of Charles Darwin, vol. 25, Appendix VI. We are very grateful to Andreas Mertgens for his time and expertise in deciphering the manuscript text and providing the English translation.